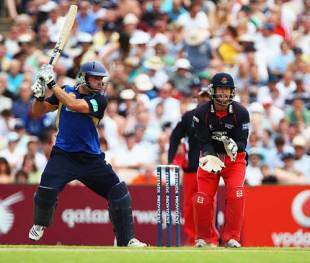 Hampshire batsman Michael Lumb has earned his first international selection in England's preliminary squad for the Champions Trophy in South Africa this September, which includes both Kevin Pietersen and Andrew Flintoff. The 30 probables will be reduced to 15 by August 23. "With the exception of Hampshire's Michael Lumb, who has been in excellent form for his county this year, each member of this preliminary squad has experienced playing for England on the international stage," ECB national selector, Geoff Miller said. "It is pleasing to see such genuine competition for places as we look to half the squad later next month. "We have an exciting blend of youth and experience in this preliminary squad and we'll continue to watch the limited-overs form of all players involved over the coming month." Lumb has scored 393 runs in nine matches at an average of 49.12 for Hampshire during the Friends Provident Trophy this season. He's also scored 416 runs at a strike-rate of 160 in the Twenty20 Cup. Pietersen has been ruled out of the remainder of the Ashes after undergoing surgery on his Achilles tendon, while Flintoff is determined to play through the pain barrier in his final three Tests. The most notable omission is Samit Patel, the Nottinghamshire allrounder, who was dropped from the one-day squad before the series in West Indies for failing to meet fitness targets and has continued to be overlooked this season. Despite repeated warnings from the England selectors and his county coach, Mick Newell, he has still not been able to hit the required levels. He has also struggled for form and currently averages 21.90 in the Championship, while his 13 wickets have cost 37.38. In the 50-over Friends Provident Trophy he averaged 20.71 with the bat. The squad also features the uncapped Joe Denly, the highly regarded Kent batsman who impressed against the Australians prior to the first Ashes Test, along with his county captain, Rob Key, Essex allrounder Graham Napier and Tim Bresnan, the Yorkshire seamer who is in excellent form with the ball. James Foster and Matt Prior earn wicket-keeping slots, though Steve Davies from Worcestershire - who made his Twenty20 debut against West Indies earlier this year - was also named. Squad: Andrew Strauss (Middlesex), James Anderson (Lancashire), Gareth Batty (Worcestershire), Ian Bell (Warwickshire), Ravi Bopara (Essex), Tim Bresnan (Yorkshire), Stuart Broad (Nottinghamshire), Paul Collingwood (Durham), Alastair Cook (Essex), Steve Davies (Worcestershire), Joe Denly (Kent), Andrew Flintoff (Lancashire), James Foster (Essex), Stephen Harmison (Durham), Ed Joyce (Sussex), Rob Key (Kent), Michael Lumb (Hampshire), Sajid Mahmood (Lancashire), Dimitri Mascarenhas (Hampshire), Eoin Morgan (Middlesex), Graham Napier (Essex), Graham Onions (Durham), Kevin Pietersen (Hampshire), Matt Prior (Sussex), Adil Rashid (Yorkshire), Owais Shah (Middlesex), Ryan Sidebottom (Nottinghamshire), Graeme Swann (Nottinghamshire), Jonathan Trott (Warwickshire), Luke Wright (Sussex).